Turkish President Recep Tayyip Erdoğan’s security guards detained and beat an Istanbul lawyer for insulting the president after questioning blocked traffic at the site of a wedding ceremony attended by Erdoğan, Cumhuriyet newspaper reported on Tuesday. The incident took place when lawyer Sertuğ Sürenoğlu asked police why traffic was blocked around the city’s Çırağan Palace, where Erdoğan was in attendance for a high profile wedding on Sunday, the newspaper said. 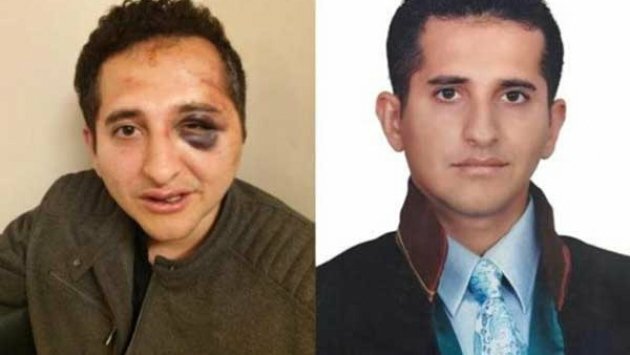 Erdoğan’s security handcuffed Sürenoğlu and placed him in a vehicle where he was beaten for two hours, it said, adding that the security guards then forced Sürenoğlu to sign a police report stating that he had insulted Erdoğan. The lawyer was then handed over to police who took him into a station, Cumhuriyet said. After being questioned for insulting the president, Sürenoğlu was released on house arrest. “I didn’t even know that President Erdoğan was going to be there. I only asked why the road was blocked off. I absolutely did not insult the president. I was tortured by the president’s guards and forced me to sign a report saying I had insulted the president,” Cumhuriyet quoted Sürenoğlu as saying in his statement while in police custody. Insulting the president carries a sentence between one and four years, according to the Turkish Penal Code. Erdogan's bodyguards, beaten the lawyer, he had the record signed!